International Journal of Asian Studies (IJAS) is an interdisciplinary, English-language forum for research in the social sciences and humanities. IJAS examines Asia on a regional basis, emphasising patterns and tendencies that go beyond the borders of individual countries. It is particularly interested in locating contemporary changes within a historical framework, especially using interdisciplinary approaches, and so promotes comparative studies involving the various regions of Asia. 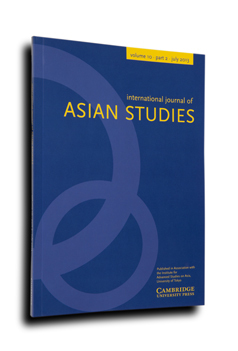 As well as encouraging contributions from western scholars, IJAS focuses attention on the work of Asian scholars, in order to encourage multi-directional communication across the international Asian studies community. It includes both themed and general issues. The Journal seeks both original papers and survey articles that fall within its scope as outlined above. Since the Journal is attempting to cross methodological boundaries, we would particularly appreciate papers that can develop new methodologies within their general approach. Papers must be in English and in principle no more than 12,000 words in length, including footnotes. Submissions will be sent on to referees.